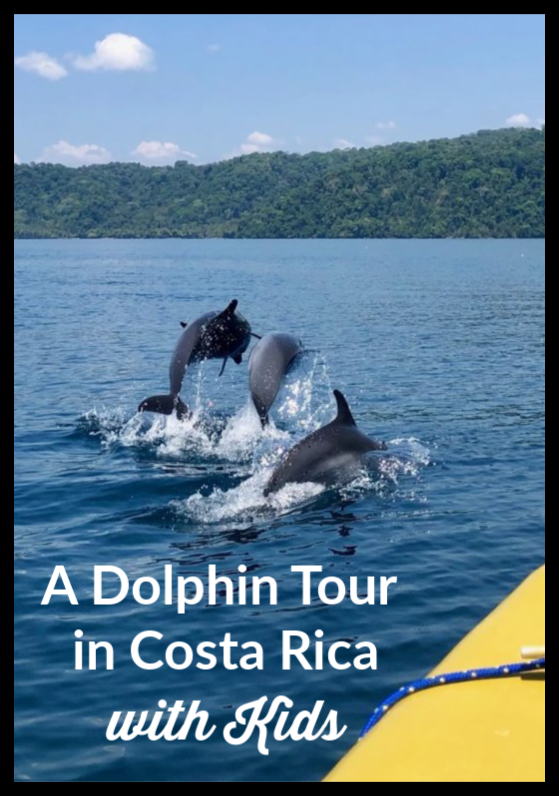 It’s hard to overstate my excitement when my husband finally agreed to book a dolphin tour in Costa Rica through our trusted friends at Aventuras Tropicales, leaving out of Puerto Jimenez (there are many, many dolphin tours of all shapes and sizes in Costa Rica). My husband Todd is a fisherman who thinks that going anywhere near waves without a hook in the water is a crime, and in the past he’s noted that dolphins can be easily viewed from a fishing vessel in the blue water, so why book a tour? 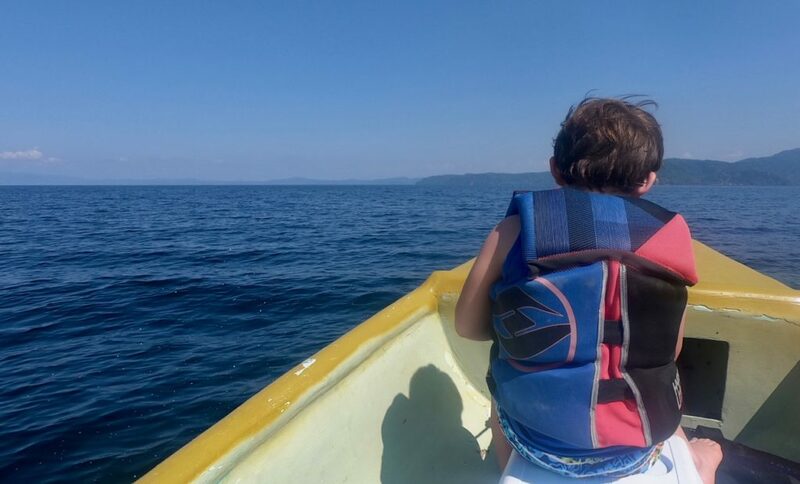 He is not immune to my charms, however, so this year I finally got my wish, and we packed up our two youngest kids plus a grandma and set off to see what we could see in the magical waters of the Golfo Dulce. The Golfo Dulce, located along the south Pacific coast of Costa Rica adjacent to the Osa Peninsula, is a unique biome that teems with life. Fifty percent of the flora and fauna of Costa Rica can be found here (and Costa Rica has a whole lot of flora and fauna). 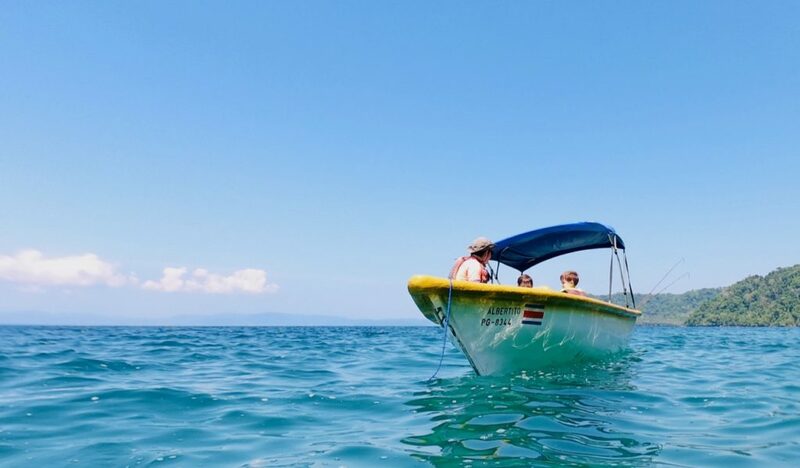 Literally translated as “sweet gulf,” the warm waters of this bay are home to all four species of sea turtles that call Costa Rica home (pacific green sea turtle, hawksbill, Ridley, and leatherback), as well as an abundance of whales, rays, sharks, fish. Our guide, Albertito of Aventuras Tropicales, in the panga Albertito, with my kids who quickly tired of snorkeling. But it was the dolphins I really wanted to see. I had been near bottlenose dolphins before, as they play close to shore, but the pantropical spotted dolphins tend to hang out farther from land. Would I get lucky? Morning at the public dock in Puerto Jimenez has a magical quality that makes you want to pinch yourself a little. Fishing boats bob gently in the bay, a warm wind washes over your (slightly sunburned) skin, and scarlet macaws screech overhead in pairs, flitting in and out of almond trees. At the short crescent of a town beach, we climbed into the Albertito, a panga seating four to six people, with an outboard motor, overhead shade, and comfortable seats: a perfectly sized boat for our crew. The boat was guided by Albertito himself, who has been guiding tours in the Golfo Dulce practically since birth. As we gently gathered speed over the sweet waters of the bay, he scanned the waves for wildlife. We headed across the Golfo Dulce to the east side of the bay, which has the best snorkeling. 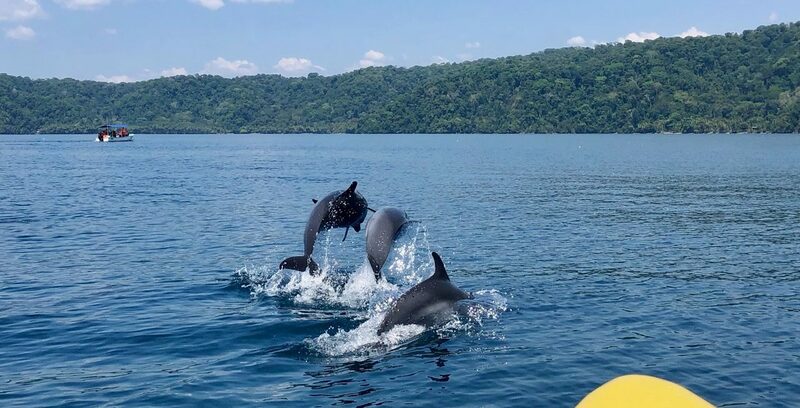 This tour allows you to look for dolphins before and after a break for snorkeling and snacks, which works out well with children. We anchored near a tiny beach and jumped out, immediately spotting a Moray eel, which was a first for us. My husband and I had a great time snorkeling, although our three-year-old and six-year-old did not, and were content to splash around in the shallows on the beach, collecting rocks and shells. 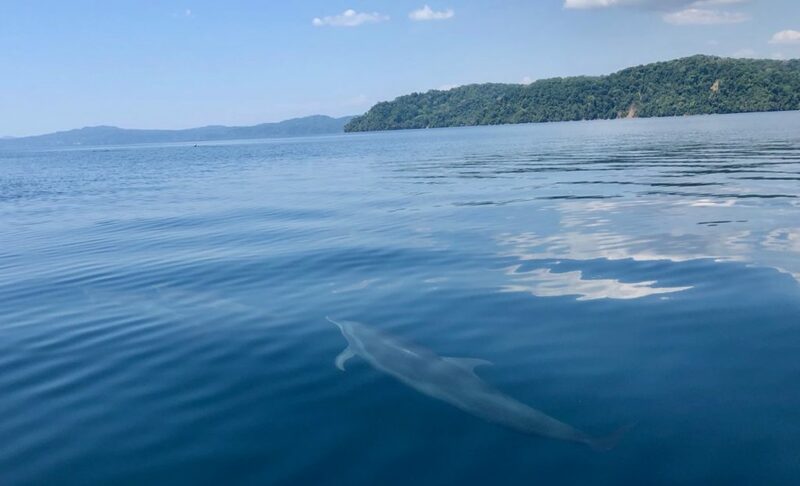 Viewing the dolphins gliding under the clear waters of Golfo Dulce was a sweet treat. At the first sight of the shiny, dark, curved bodies rolling over the waves, everyone cried out. I ran to the bow of the boat, and was immediately grateful we were in a panga and not a giant fishing boat. The small size of the boat meant we were only a few feet above the waves, and I could see the dolphins’ entire bodies through the clear water as they zoomed under us. It sent a thrill through my entire body. I have seen dolphins before in the wild, but rarely do you get to see them whole, and not just catch glimpses of them above water. They seemed so serene and happy, occasionally jumping through the warm air. We motored quietly around to stay within sight of them, but they could swim far faster than our boat could move. Their continued presence around us was a gift. A couple other tours gathered to watch as well, but we all stayed a respectful distance away from each other. I felt a surge of gratitude for Costa Rica’s commitment to ecotourism and its underlying respect for the natural world. I always feel as though visitors are taught better ways to respect the country’s animals, and not as though they are being exploited. In fact, I asked Albertito to please tell me that there was some appropriate way in which to swim with dolphins; I would love to be closer to those creatures! He smiled at me and said, “Sorry, no,” affirming again what I already knew: that any attempt to interact with wild animals inherently interferes with them, and that respect and appreciation demands that we allow them to live their lives, just watching from afar. We watched and watched, as the dolphins zipped all around us, a group of six on one side, a group of ten or so on the other. I felt like we were right in the middle of their family reunion. After twenty or thirty minutes, they were suddenly off, disappeared beneath the waves, as quickly as they had arrived. We all sent them heartfelt and vocal thanks for the show, for sharing themselves with us that day.